So far, Southwest Virginia’s congressional representatives aren’t exactly covering themselves with glory when their statements are measured on PolitiFact Virginia’s Truth-O-Meter. PolitiFact Virginia is run by The Richmond Times-Dispatch, a reliably conservative editorial voice. They started putting politicians’ statements to the test last fall. I don’t know why Goodlatte has gotten away with such little scrutiny. I know for a fact that he has been caught in some whoppers. This isn’t a Republican/Democrat thing, by the way. Former Rep. Tom Perriello, who I have great respect for, didn’t fare a whole lot better under PolitiFact’s scrutiny. Of five statements examined, two were found to be half true and three were false. Former Rep. Rick Boucher had two statements examined; one was half-true and one was barely true. House Majority Leader Eric Cantor’s PolitiFact file is worth taking a look at, too. If politicians are going to lie – and they are – it’s good that places like PolitiFact are helping hold them accountable. In a Roanoke Times article today, Rep. Morgan Griffith said gerrymandering his 9th Congressional District to include Salem – where he lives – would respect the wishes of the district’s voters. Yes, certainly. 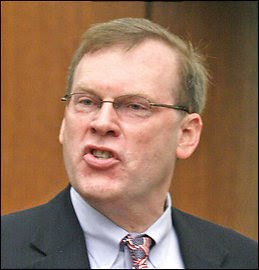 Since a majority of the conservative 9th Congressional District voted for a Republican over a Democrat in a Republican sweep year – a Democrat who had been subjected to an unprecedented barrage of negative advertising paid for by outside interest groups – it certainly makes sense to put Salem in the same congressional district as Abingdon, Va., rather than neighboring Roanoke. This year’s redistricting process, it is increasingly clear, has absolutely nothing to do respecting the voters and everything with accommodating incumbents. Voters should not be pleased, and they should remember in November. I wasn’t in Virginia for the 2001 redistricting, so it’s hard to compare the current atmosphere to last time. (I was in West Virginia at the time where Democrats were in solid control and I don’t remember gerrymandering being much of an issue.) But it seems to me that ordinary citizens are paying better attention to the process, and they’re not liking what they’re seeing. This is good. The process is a politicized mess that should please no one. Republicans are irritated with the map drawn up by Senate Democrats. Democrats are angry about the map drawn up by House Republicans. And citizens groups are torqued off at both parties. Even some legislators are criticizing the process. “The majority parties in both houses took a parochial, self-centered, selfish, protect-the-incumbent approach that was decidedly and markedly not the people’s business,” said Del. Joseph. D. Morrissey, D-Henrico, in a floor speech. Student teams across the state drew maps for a contest designed to show what redistricting would look like without political influence. Those maps were barely given a glance by lawmakers according to Anita Kumar’s Virginia politics blog in The Washington Post. “We’re here to do the people’s business but in viewing the legislative proposal from the Senate and House, it is clear that they put their own business first and not the people’s,” said Morrissey, who plans to introduce a map based on one created by a George Mason University team. Morgan Griffith stepped up to the big league when he knocked off Rep. Rick Boucher last November, winning the right to represent the people of Virginia’s 9th Congressional District. So far, though, he’s showing an embarrassing lack of grasp of the issues he’s supposed to be dealing with – especially in the e-newsletters he sends out to his constituents. First, there was the one where he claimed the EPA instituted a new rule treating milk spills like oil spills – when, in fact, the truth was the exact opposite: The EPA had cleaned up an old rule so that milk spills were not longer treated like an environmental disaster. Despite the fact that PolitiFact Virginia called him out on the mistake, the newsletter remains, uncorrected, on his website nearly two months later. In his new newsletter marking the one year anniversary of Obamacare’s passage, Griffith demonstrates a complete lack of understanding of the law and its implementation. In addition, he repeats a long-debunked claim that the law will raise the average premiums for families by $2,100 a year. In fact, the CBO found that most families would see lower premiums. Originally, Democrats promised that if you liked your health care plan, you could keep it. One year later we know that you need a waiver to keep your plan. Already more than 1,000 employers, health plans, and unions have received waivers because the law would force them to drop coverage for employees. Just to top off this steaming pile of nonsense, Griffith ends with PolitiFact’s Lie of the Year for 2010, calling Obamacare, “a costly government takeover” of the health care system. In fact, there is no government takeover. Obamacare is a market-oriented solution that, for better or worse, keeps the private insurance industry fully involved in the health care system. Outside of Medicare and Medicaid’s coverage for the elderly and the poor, there is no public option for citizens. Outside of the VA system, there are no public hospitals or public doctors. Again, for better or worse. If there’s one correct statement in Griffith’s March 25 newsletter, I couldn’t find it. Well, except for the first sentence: “This past Wednesday marked the one year anniversary of ObamaCare.” It went downhill after that.